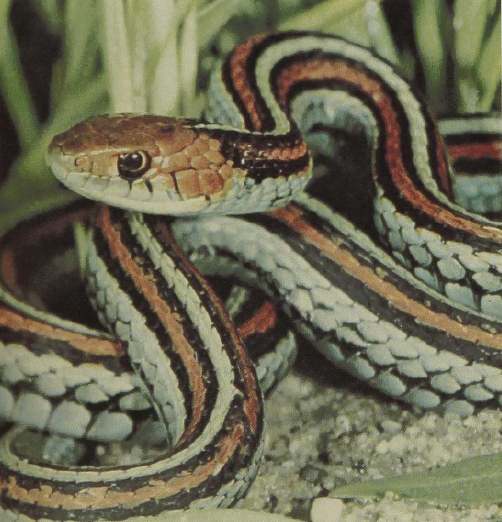 This is by far the most common of the ribbon and garter snakes; it ranges from Texas to Alaska and from California to New England. Altogether there are more than a dozen species of snakes in this genus and nine varieties of the Common Carter Snake. The garter snake, particularly in the northeastern states, may occur in enormous numbers, and great aggregations may be seen along stream courses during hibernation. While these animals are closely related to the water snakes, they are generally more slender, feed on smaller prey such as earthworms, invertebrates, minnows, and small frogs, and range farther away from water. Most commonly these snakes, which attain lengths of between 20 and 40 inches, show various kinds of brownish and yellowish stripes along the back as well as some checkerboard or blotched pattern superimposed on these.